While the world music scene has flourished with performers mainly with Third World connections, a number of mainstream artists have tried their hand at doing world music influenced recordings. Most famously, Paul Simon’s Graceland album brought South African music to millions of fans. Peter Gabriel has also been prominent working with performers from Africa and the Indian Subcontinent. The latest project combining a pop artist with world music styles is Joss Stone, though she does not give herself top billing on the album, which is called Project Mama Earth. Joss Stone is the British soul-influenced singer whose 2003 debut album The Soul Sessions became a multi-platinum hit. She has released a steady stream of well-crafted soul-influenced albums since then, most of which were big sellers. In the meantime, she has taken on film and television acting roles. Project Mama Earth came about somewhat spontaneously. Ms. Stone and four other players from various backgrounds convened at Stone’s house, and according to Ms. Stone’s website, “They had no songs. No chord charts. No game plan. No safety net. Nothing, in fact, but a plan to play and catch the sparks.” Her collaborators on the project were keyboard man Jonathan Shorten, who appeared on four other albums with Ms. Stone; bassist and guitarist Etienne M’Bappe, who was a member of John McLaughlin’s group 4th Dimension; guitarist Nitin Sawhney, a British musician with an Indian background who also plays jazz and flamenco; and drummer Jonathan Joseph, who played on Ms. Stone’s debut album and also toured and recorded with Jeff Beck. Joseph was influential in the initiation of the project, with Ms. Stone inspired by a book Joseph wrote about African rhythms. Also appearing on Project Mama Earth are some horn players. The result is a short recording, just 30 minutes with six creative songs and five short atmospheric interludes. African rhythms, especially the three-against-four structure are prominent, which forms a nice juxtaposition with Ms. Stone’s blue-eyed soul vocals. It’s the most interesting recording Ms. Stone has done and for me, the most engaging. 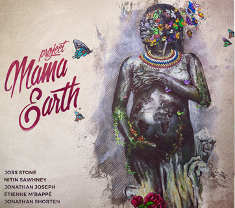 Project Mama Earth, the new release from Joss Stone and her colleagues is a worthwhile and interesting new recording from a popular artist venturing into world music influence, and doing it successfully. It’s a short recording at only a half hour, though it has eleven tracks including the short interludes. The combination of musicians is a compatible one with some of the guys having worked with Ms. Stone before, and their musical interaction is one of the strengths of the album. Our grade for sound quality is an A-minus. The vocals and instrumentation are cleanly recorded, the atmospheric effects are well handled and the mix has everything in the right place sonically. But we deduct the usual points for the volume compression that robs some of the dynamics in order to jack up the volume. Despite Joss Stone’s star power, her name is not displayed prominently on Project Mama Earth, perhaps that is because it was a collaboration rather than a star and sidemen. Perhaps it’s because the recording is such a departure from Ms. Stone’s other albums. But in any case, it’s an engaging and enjoyable recording that shows a different, and versatile side of a hit artist.